MICHAEL and Anne Goodwin might be considered somewhat of an anomaly in today’s culture. This month the couple celebrated 50 years of marriage, 50 years of friendship, and 50 years of true love. On Saturday, October 6, the Goodwins will renew their wedding vows and commemorate the sacrament of matrimony at St Stephens Cathedral’s annual Golden Wedding Anniversary Mass. The couple – although reluctant to offer any advice – said that faith and transparency had played a big role in their marriage. 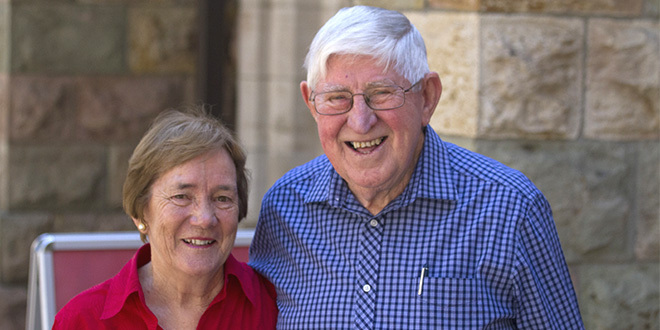 “Someone asked me last week: what’s the secret to 50 years of marriage?” Mr Goodwin said. “‘I don’t have a secret’, I said. “Then I thought, maybe the secret is that we don’t have any secrets. “That’s something that is very important. Mrs Goodwin attributed the success of their marriage to good fortune and being fortunate to stand on the shoulders of giants who came before her. “We both had very loving parents,” she said. “Michael is the eldest of six and I’m the youngest of nine, so I had a long line of people to follow,” she said. Even though the couple have spent five decades together, their longevity still remains a mystery to Mrs Goodwin. “We often wonder why two people click and then continue to be comfortable in each other’s company,” she said. Perhaps some of that mystery lies in their life-long devotion to the Catholic faith and their affection for St Stephens Cathedral. If you recognise Mr Goodwin, it’s likely that his smile has greeted you at the entrance to the cathedral, where he volunteers his time as one of the tour guides. Mr Goodwin is adamant, however, that when it comes to faith, his wife sets the pace. “To me, Anne is a great example of someone who has a good prayer life,” he said. “She has a great morning prayer routine, which I don’t have. It’s probably because I talk too much. “(Faith) is something that’s always been there because we’ve both grown up with it. In spite of their strong faithfulness to the Catholic Church, the couple are realistic when it comes to parenting. “We have very good boys, but we realised as parents that not everyone is going to follow the exact path that we set,” she said. “You can’t rant and rave and say ‘you must do this because that’s what we’ve always done. In addition to their four sons, the Goodwins have five grandchildren – two of whom recently celebrated the sacrament of confirmation – but the 50 year veterans recognise the challenges that face parents today. “The pressures are different,” Mr Goodwin said. “When I was 10, it was easier in a lot of ways, because the ‘regime’ was stricter. “We didn’t have the freedom to make decisions and express opinions in the way children do today. “Now, that’s not a bad thing. I don’t want to go back to seeing how kids were treated at school when I was a boy. Mrs Goodwin also acknowledged today’s culture presented unique challenges for parents, as well as children. “Parenting is harder today,” she said. “We were a lot more innocent in many ways. “The little ones today know things at eight that I didn’t know until I was in my twenties. The Goodwins admit challenges are inherent to all good marriages, and quitting is never an option. In fact, for the Goodwinss, there’s nothing a good conversation over a game of scrabble can’t fix. “50 years of marriage is like a 50-point triple word score,” he said. The Goodwins will join a number of couples on October 6 who have reached the golden milestone, including Michael’s brother and wife, who will celebrate their 50-year anniversary on September 22. Mr Goodwin also hopes to share the day with a priest who holds a special place in his heart. “One of the great privileges we’ve had is knowing Father Ron Mollison,” he said. “(Fr) Ron and I grew up together and he was ordained 6 weeks before we were married. “We were his first marriage. The Golden Wedding Anniversary Mass will start at 10am on Saturday, October 6 at St Stephen’s Cathedral.